These baked oatmeal cups are a grab and go breakfast made with oats, milk, brown sugar and eggs. 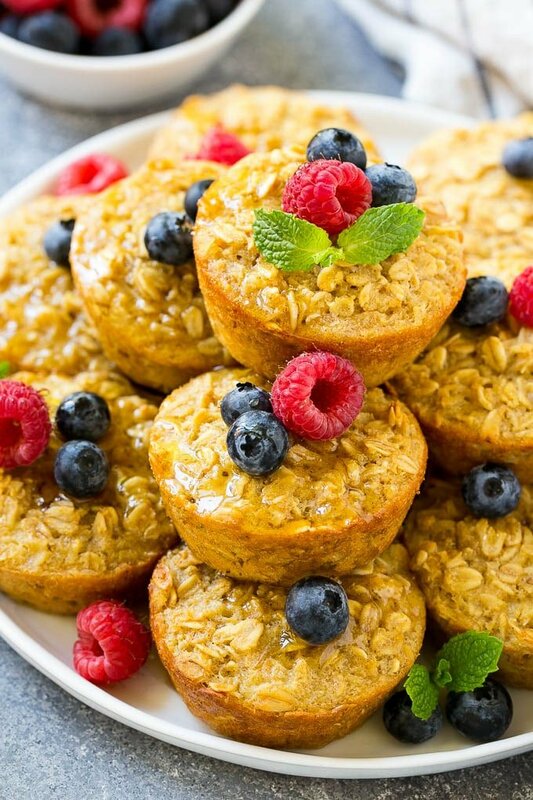 Top your oatmeal muffins with maple syrup and fresh fruit for a wholesome and filling meal! 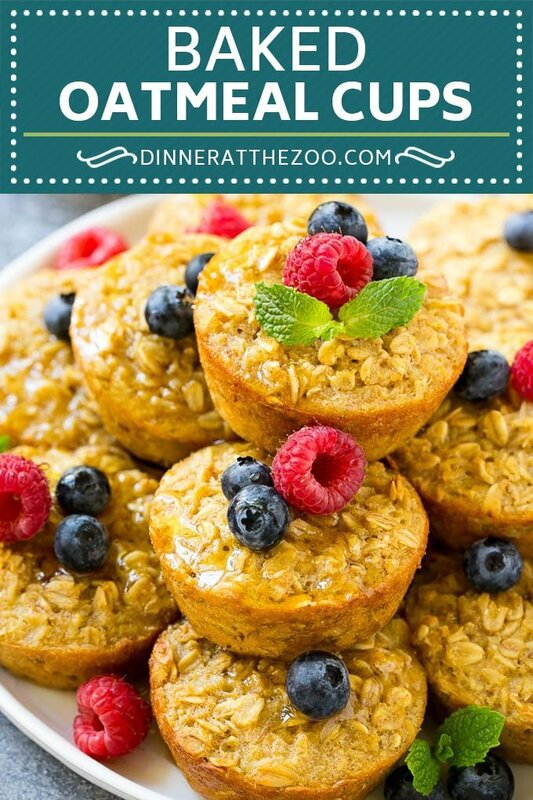 I’m always looking for quick breakfast options, and these baked oatmeal cups are a hit with both kids and adults. You can easily customize them to your taste preferences and they reheat beautifully. Breakfast…it’s an easily forgotten meal of the day. I’m personally the worst at skipping it, which is why I love these baked oatmeal cups. They’re a hearty and nutritious mixture of oats, cinnamon, applesauce, and brown sugar, perfect for a quick but filling breakfast or snack. 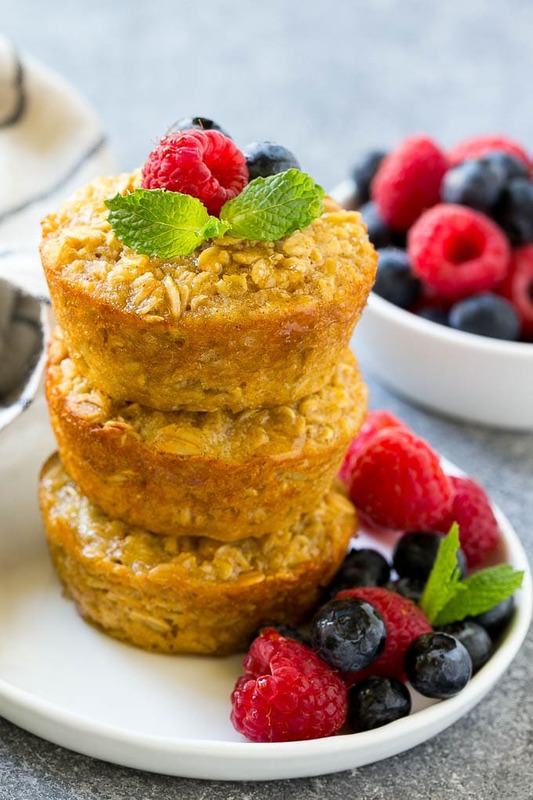 HOW DO YOU MAKE BAKED OATMEAL CUPS? If you can make a boxed cake, you can definitely tackle this easy baked oatmeal recipe. 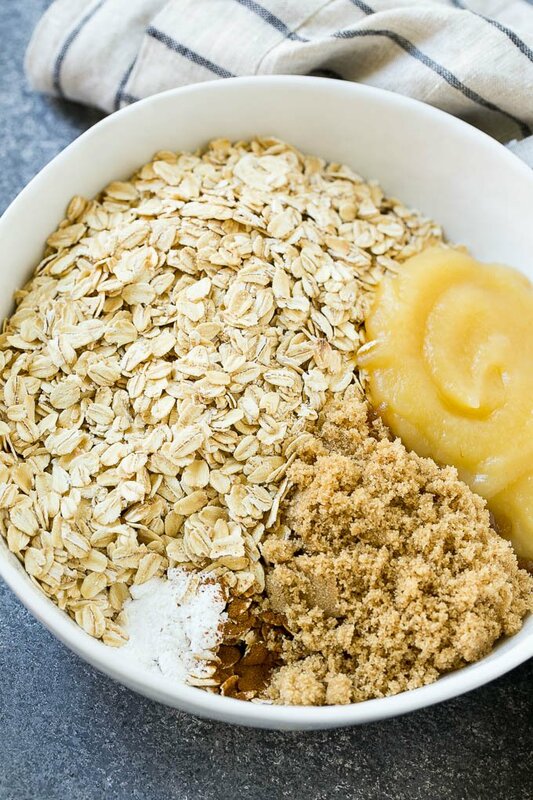 Simply combine the old fashioned oats, brown sugar, apple sauce, milk, and other ingredients in a bowl and mix well. Spray your pan, drop in the batter, bake, and you’ve got a delicious breakfast for now and later. If you like to meal prep, then this baked oatmeal recipe is a good go-to breakfast. I’m all about meal prep and have even gathered an entire list of amazing meal prep ideas. Even if you’re not into meal prepping, these make a tasty breakfast that’s quick and easy. You can eat your baked oatmeal cups warm or cold. To warm them up from the fridge, just pop them into the microwave for about twenty seconds. These are so easy that the kids just pop them into the microwave themselves, and grab their own breakfast; that’s a win for mom! HOW DO YOU MAKE BAKED OATMEAL WITH EGGS? The eggs act as a binder in this recipe to help all the ingredients stick together and form these fun little cups. The eggs also add a nice amount of protein into the mix. This recipe calls for 2 eggs which creates the perfect texture for the baked oatmeal. HOW DO YOU MAKE BAKED OATMEAL HEALTHY? 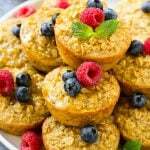 Most of the ingredients in these baked oatmeal cups are healthy – oats, eggs, milk and applesauce all have nutritional value. The best way to make these oatmeal cups healthier would be to reduce the amount of brown sugar and butter. I keep a big batch of these baked oatmeal cups whipped up and ready to go no matter the season. They’re great eaten hot or cold and can be topped with whatever you like to keep the flavors fun and varied. While I typically eat my oatmeal cups with a drizzle of maple syrup and fresh berries, you can choose your favorite toppings. Sometimes I even add a few sprinkles to entice my little one to eat them. The possibilities are endless! Preheat the oven to 350 degrees F. Coat the wells of a 12 cup muffin tin with cooking spray. Add the oats, baking powder, cinnamon, brown sugar, applesauce, milk, eggs, butter and vanilla extract to a large bowl. Spoon the oatmeal mixture into the prepared muffin tin. Bake for 20-25 minutes or until golden brown. Cool in the tin for 5 minutes, then transfer to a baking rack to cool. Serve, topped with maple syrup and berries if desired. Oatmeal cups can be stored in a covered container in the refrigerator for up to 5 days. 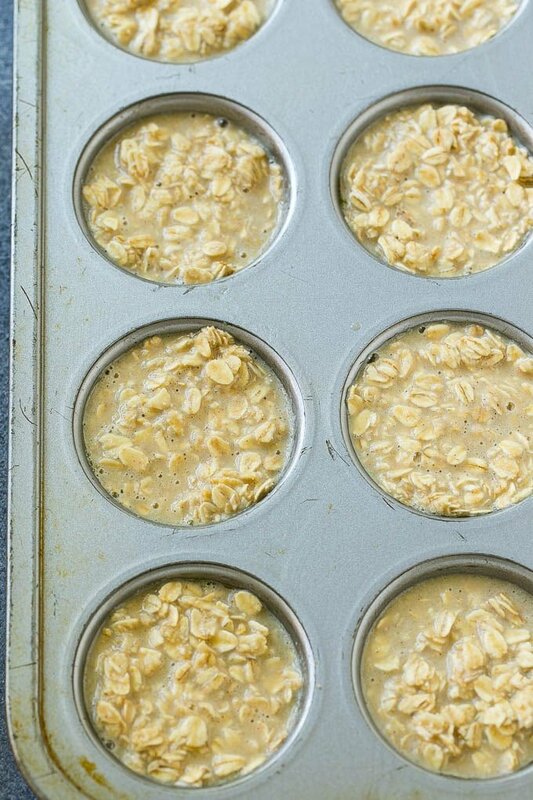 For freezer storage, place the oatmeal cups on a parchment lined sheet pan, then freeze until solid. Transfer the oatmeal cups to a freezer bag for longer term storage. 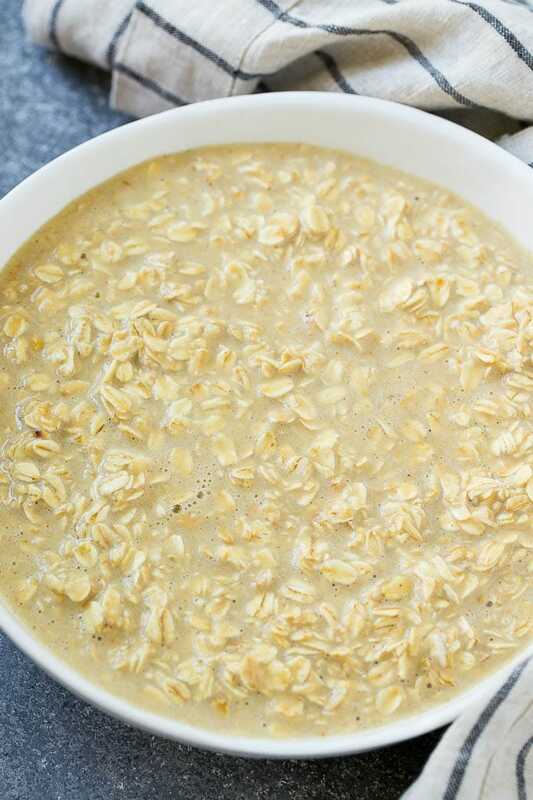 To reheat, microwave an oatmeal cup for 20-30 seconds. This recipe looks wonderful! I would like to try with honey as a substitution for the brown sugar. What quantity honey would you suggest? Would you suggest modifying the liquid to adjust for the wet honey vs. the dry brown sugar? You can use the same amount of honey, but you’ll want to decrease the amount of milk by 2 tablespoons. Honey can brown quicker than brown sugar, so just watch the oatmeal cups in the oven to make sure they don’t burn! I found these when I was doing a blog share thing, and they looked so amazing. They were an instant hit. Perfect for breakfast. 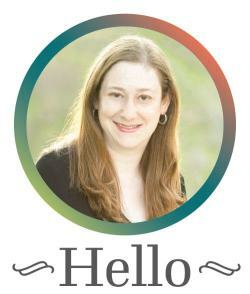 I’m adapting and putting them on my blog too with our favorite mix-ins! I’ll link back!! I really do love oatmeal and really love oatmeal cookies. I haven’t had much when it comes to muffins though and oatmeal. i will have to try this out. these look so yummy. a great snack for my kids especially for school lunches. Just made them! So excited for breakfast this week! These look like a fantastic breakfast muffin! I am a huge lover of all things oatmeal. I will have to print this recipe off and try it soon! These look so yummy and healthy. I will try these for my family. Thanks for sharing. These oatmeal cups look delicious! I need quick grab food items in the morning so I will totally have to give these a try! Yum! I will be making these this summer! Sounds quick and easy. I love oatmeal cups. Well, I love oatmeal period. These look delicious. Yummy! These look so good, I love finding breakfast foods that can be made ahead. These look and sound so delicious! I’m definitely going to try to make some. These look soooo good. I have seen so many different recipes for egg cups but never oatmeal. I can smell the cinnamon and brown sugar just looking at the photos. Saving this to try for a family brunch! wow! this surely looks delicious! but what i like most about it is that it is healthy and easy to make! make a bunch and everyone’s happy for breakfast! Oh my goodness how delicious does this look, I bet they taste amazing and I love that they are healthy as well.